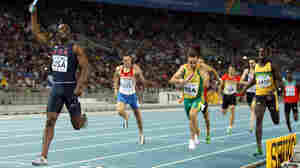 LaShawn Merritt crosses the finish line first, in the men's 4x400-meter relay at the IAAF World Athletics Championships in Daegu, South Korea, Sept. 2. Once banned for doping, Merritt has been cleared to run in London next summer. October 6, 2011  In allowing U.S. sprinter LaShawn Merritt to compete, the court said the IOC rule known as the "Osaka Rule" is "invalid and unenforceable" because it extends punishments beyond the guidelines of the World Anti-Doping Code.